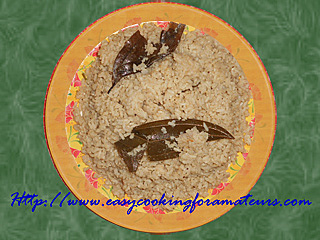 This rice is simple to prepare and not much spicy, it is prepared instead of white rice to serve with Non-Veg stew (curry) tastes delicious. This is Karnataka cuisine prepared in functions and famous in villages. Note: As this is served with spicy curry, no chilly or spice powders added. Grind all the ingredients with little water. Keep side. Heat oil In the pressure cooker. Add kapok buds, cardamom & bay leaves, fry for few seconds. Add onion, saute till light golden color. Add grind paste, saute till raw smell goes. Add water & bring it to boil. Taste, adjust salt if required. Tempered Rice/Vagarane Anna is ready to serve with chicken curry or mutton curry. Wow.. looks so tempting and perfect..
Vagrane anna looks simply amazing and tempting.. thanks for sharing !! A very nice rice! Yummy and delicious! Delicious and marvellous tempered rice, inviting..
Quick and simple rice..nice one. quick fix on a lazy day.. nice! Good one! I can almost smell the fragrant rice. Great for a speedy meal! Yummy! What a great dish! I would love to give this a try, I think my hubby and I would love it! wow..lovely blog and yummy recipes.. Simple and yummy rice. This is my first time here and I am following you for more yummy recipes. I would also like to invite you to visit me as time permits and would love for you to follow my blog if you like it.